Good or bad, most art is manufactured. I don’t necessarily mean that negatively, I just mean that most artists share the same set of ingredients and processes as they attempt to get to a final result that will hopefully come across as original and honest. It’s like humans. Our genetic makeup is essentially 99.9% the same but every single one of us is still unique from head to toe. Most art shares in this concept. However, there are some artists who approach the creative process as more of a labor and birth. They are intent on bringing into existence something that has always been, but that hasn’t exactly been here with us. Sandra McCracken is just such an artist and she has once again added her voice to the choir of truth and creativity. Sandra McCracken’s newest album, In Feast Or Fallow, is a great collection of old and new hymns sung against a lush indie-folk backdrop. Like all of Sandra’s releases, the lyrics steal the spotlight of the record. For her hymns projects, Sandra mixes her original compositions with texts that were written centuries ago. One of her gifts lies in the fact that you can’t tell which is which without looking at the liner notes. Take album opener “Petition” for example. Written in the 1700’s by a woman whose fiancé drowned the day before they were to be married, Sandra is somehow able to find herself in the song enough to seamlessly add her own verse. It takes a special talent to be able to successfully bridge a 300 year gap between co-writers, much less do it again and again! Found amongst the older hymn reworkings are Sandra’s own offerings such as the journal-entry intimateness of “Hidden Place.” Written just a few days before her daughter was born, the song feels more like you’ve stumbled upon an overheard conversation. To her credit, Sandra is still able to make this unique set of maternal feelings and confessions relatable and inclusive. For the title track “In Feast Or Fallow,” Sandra is joined by Thad Cockrell and her uber-talented husband Derek Webb. Their three voices blend together amazingly well to tell the story of the seasonal shifts our lives should go through to be able to produce, to pause, and to endure. My favorite track on the album would either have to be “Faith’s Review & Expectation” (which I reviewed HERE) or “Justice Will Roll Down,” a song that strives to move social justice beyond the confines of cliché and looks forward to the making right of all things. The whole song jams and the last verse is enough to cause some church to break out wherever you are. Throughout the album, Sandra is not afraid to ask some hard questions while also resting on the fact that the only answers may be faith, patience and praise. There are even a couple of musical interludes scattered throughout to both offer a moment of reflection and remind us that sometimes even our best words are inadequate expressions. Sandra gives credit for the musical tone of the album to her husband Derek Webb who produced the album and played all the parts that she didn’t. I must say, I’ve been a huge fan of Derek’s for about 16 years now and he never disappoints. Sandra’s guitar and piano playing is beautifully augmented throughout the album by Derek’s mixture of organic and inorganic musical elements. Banjo lines bounce effortlessly over drum loops, guitars are strummed through atmospheric synths, and live pianos mingle with keyboard samples to create a stunning foundation for the hymns to stand upon. The musical and lyrical elements of the album compliment each other just as much as Derek and Sandra do. It’s a special moment anytime a person can share themselves enough to make another say “me too.” Whenever this admission can be taken ahold of and replicated into songs, the listener suddenly has a companion for the journey. One that points ahead, walks beside and reminds of grace. I’m happy to take all of that that I can get. 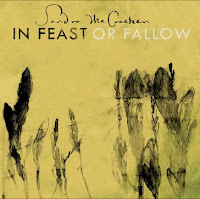 In Feast Or Fallow is set to be released on April 27th and can be pre-ordered on www.sandramccracken.com and www.newoldhymns.com.